This Labor Day Weekend, come sew your wild oats. Sew yourself a little black dress, or some beaded fingerless gloves. All weekend long, today through Monday, you can come and stitch for free at SEW Woodstock, the new shop on Route 212 in Bearsville, a quarter-mile down from the Cub Market. "Many people can't find the space to sew at home," says SEW Woodstock owner Sally Russ. "They have to clear their dining table and it's a whole production." In her new shop, people have plenty of space to play, as well as access to all the machines and supplies they need - not to mention the company of fellow sewing enthusiasts of all levels and abilities. "We want people to see how much fun it is to sew together," says Russ. The idea for the business grew out of Russ's weekly "stitchy day" gathering, in which her seamstress (and wannabe seamstress) friends come to sew, relax, chat, nosh, and offer advice and admiration of each other's creations. When the group grew too big for its britches, Russ started envisioning a shop based around the concept, and SEW Woodstock was born. She found space in the old Loominus building, and spent months restoring it with reclaimed wood and other details that match her warm, earthy aesthetic (Russ is also a photographer in the local notable Photosensualis duo, with Michael Williams). One of the core offerings at SEW Woodstock is its Stitchers' Co-op, which lets members come and sew anytime during the store's open hours for $40 a month. The shop also offers classes and workshops with its lead teacher, Molly Farley, whose first class, "Making Peace with Your Sewing Machine," starts on September 21. (You don't have to be a member of the co-op to take classes.) Offering an array of artisanal and organic fabrics, creative kits, and notions, SEW Woodstock is also the place to bring your tailoring and alterations. Mostly, it's a space to let your creativity blossom - and a great new addition to the crafty-store vibe in artsy Woodstock. 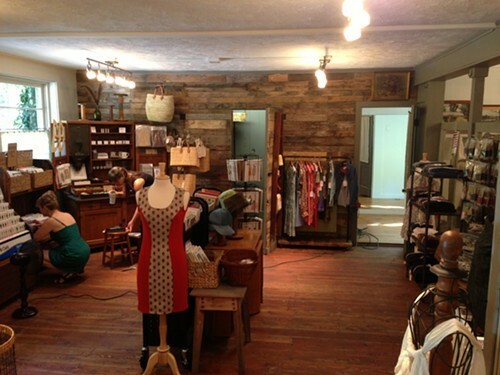 SEW Woodstock is located at 3257 Rte 212 in Bearsville. Phone: (845) 684-5564. The shop has no website yet, but check out its Facebook page.